Editors: Yvonne Yazbeck Haddad and Jane Idleman Smith. Albany: State University of New York Press, 1994. 545 pp. $89.50 ($29.95, paper). As the numbers of Muslims resident in the United States and Canada increase, they also become more diverse. Just how diverse becomes apparent in this tightly edited volume in three sections. Part one deals with religious communities (Shi'is, Nation of Islam, and others); the second with cities major (Los Angeles) and minor (Rochester); and the final with a miscellany of issues (Bektashis, elderly Muslims, attitudes towards women's employment, and so forth). 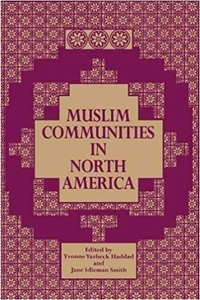 Muslim Communities in North America contains fascinating subject matter, much of it novel. For example, Yusuf Nuruddin tells of an little-known but startling group, the Five Percenters, who broke away from the Nation of Islam in 1964 under the leadership of the improbably named Clarence "Pudding" 13X. With due understatement, the author describes his immersion in the Five Percenters' theology as "a visit to another world where normal rules of logic are suspended." 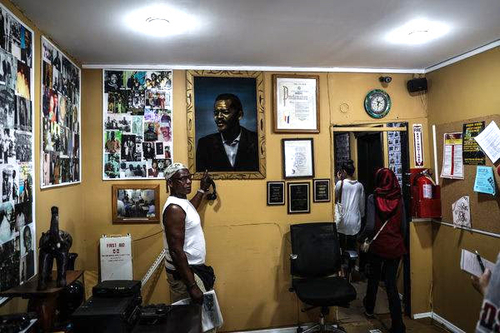 A longtime member of the Five-Percent Nation points to a portrait of its founder, Clarence "Pudding" 13X, aka Allah, in the Allah School in Mecca Street Academy, New York City. The book's only serious problem lies in its occasional apologetic quality. Thus, Matthias Gardell makes the preposterous argument that Louis Farrakhan's reputation for demogoguery, reverse racism, and anti-Semitism results not from his own rhetoric and actions, but from "misunderstanding and disinformation."